The beaches in this part of Vietnam face the Gulf of Thailand. The water is incredibly warm and becalmed; great for bathing and diving but hopeless for surfing. The best of them, Mui Nai (Stag’s Head Peninsula; admission person/car 2500/10,000d), supposedly resembling the head of a stag with its mouth pointing upward, is 8km west of Ha Tien. On top is a lighthouse and there are beaches on both sides of the peninsula, lined with simple restaurants and guesthouses. There’s no public transport to the beach. A xe om here should set you back around 40,000d. There are many islands along this coast and some locals make a living gathering swiftlet nests (the most important ingredient of that famous Chinese delicacy, bird’s-nest soup) from their rocky cliffs. 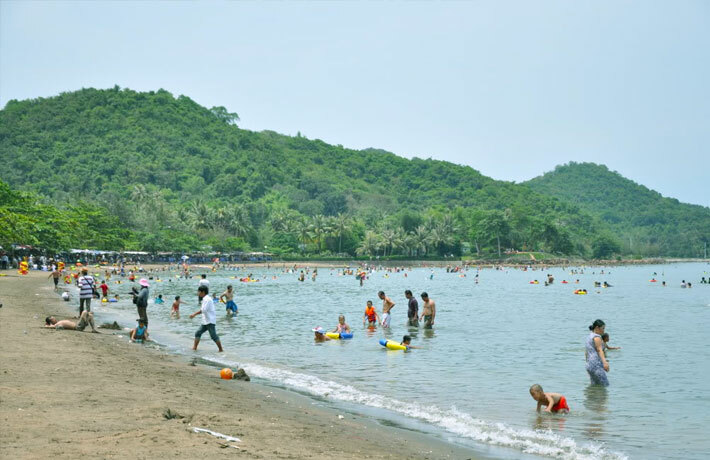 About 15km from Ha Tien and accessible by small boat, Hon Giang Island has a lovely, secluded beach. Nghe Island, near Hon Chong, is a favourite pilgrimage spot for Buddhists. The island contains a cave pagoda (Chua Hang) next to a large statue of Quan The Am Bo Tat, which faces out to sea. Boats moored near Hon Chong’s cave pagoda will transport you here for around US$150. You’ll pass Khmer pagodas, Cao Dai temples, grandiose churches and karst outcrops en route to Hon Chong, home to photogenic stone grottoes and the nicest stretch of sand on the delta’s mainland. Unfortunately, a permanent cloud of discharge from a cement factory can blight the otherwise scenic views. Beyond the beach, the main draw is an atmospheric Buddhist cave shrine. After passing through the scrappy village, the road rounds a headland and follows Duong Beach (Bai Duong) for 3km. An entrance fee is charged only at the far end of the beach (per person/car 5000/10,000d), where there are food stalls, karaoke bars, and pigs and chickens wandering around. From the beach you can see rocky remnants of Father and Son Isle (Hon Phu Tu), several hundred metres offshore. It was said to be shaped like a father embracing his son, but the father was washed away in 2006. Boats can be hired at the shore to row out for a closer look at the orphan remains. You need to walk through the market to reach the cave pagoda (Chua Hang), which is set against the base of a stony headland. The entry to the cave containing Hai Son Tu (Sea Mountain Temple) is inside the pagoda. Visitors light incense and offer prayers here before entering the cool grotto itself, whose entrance is located behind the altar. Inside are statues of Sakyamuni, Quan The Am Bo Tat and small cabinets enclosing green glass Buddhas. Mind your head on the low-hanging rock roof of the cave leading to the beach. The pagoda is swamped with pilgrims 15 days before and one month after Tet, while another deluge of worshippers arrives in March and April. ( 077-385 4369; r 500,000d) In an imposing villa on the northern headland of Duong Beach, this well-maintained and friendly, family-run place has spacious rooms, including the room of choice on the top floor. ( 077-385 4331; [email protected]; r US$60) The smartest place in Hon Chong by a stretch, Hontrem is draped over a hillock towards the end of the main strip. The hexagonal bungalows are attractively set overlooking the sea and include a large bed with light linen and generous baths. They even feature safes for valuables. The gardens are well kept and there’s a reputable restaurant overlooking the beach. Breakfast included. (mains 30,000-150,000d; 7am-10pm) On Hon Chong’s main road, a kilometre or so before Duong Beach, this seafood restaurant looks like a tumbledown shack from the outside, but serves excellent food and lovely sea views. Hon Chong is 32km from Ha Tien towards Rach Gia. The access road branches off the Rach Gia–Ha Tien highway at the small town of Ba Hon. Buses can drop you off at Ba Hon, from where you can hire a motorbike to continue the journey on to Hon Chong (around 70,000d to 80,000d). A motorbike from Ha Tien will cost around 200,000d return. Because of its network of connecting caves, Tuc Dup Hill (216m) served as a strategic base of operations during the American War. Tuc dup is Khmer for ‘water runs at night’ and it is also known locally as ‘Two Million Dollar Hill’, in reference to the amount of money the Americans sank into securing it. This is a place of historical interest but there isn’t much to see. You’ll pass near it if you’re taking the back road through Ba Chuc to Chau Doc. Ba Chuc’s Bone Pagoda stands as a ghastly reminder of the horrors perpetrated by the Khmer Rouge. Between 1975 and 1978 Khmer Rouge soldiers regularly crossed the border into Vietnam and slaughtered innocent civilians. Over the border, things were even worse, where nearly two million Cambodians were killed during the period of Pol Pot’s Democratic Kampuchea regime. Between 12 April and 30 April 1978, the Khmer Rouge killed 3157 people at Ba Chuc. Only two people are known to have survived. Many of the victims were tortured to death. The Vietnamese government might have had other motives for invading Cambodia at the end of 1978, but certainly outrage at the Ba Chuc massacre was a major justification. Undergoing reconstruction at the time of research, the Bone Pagoda has a common tomb housing the skulls and bones of more than 1100 victims. At the time of writing, the skulls were displayed in a small building nearby, divided by age group (including the minute skulls of toddlers and babies). There is still some blood on the walls above the floor of the Phi Lai Tu temple across the way. Ba Chuc is located close to the Cambodian border; to reach it, follow the road that runs along the canal from Ha Tien to Chau Doc. Turn off this main road onto Hwy 3T and follow it for 4km.